A good barbecue is a real joy - it can make a wonderful family get together or a party for friends. Although most barbecues are perfectly good, a great barbecue is rare. Here are some top tips for making sure your next barbecue is one your family and friends will remember for all the right reasons. It goes without saying that the best barbecues start with the best quality ingredients. If you are lucky enough to have a decent butcher near by, make sure you use it. Tell the butcher that you are having a barbecue and see what they offer. However, do not be swayed by their 'marinated meat' - this is likely to be once decent meat covered in some artificial marinade, unless you are lucky. It is far better to choose good meat and marinate it yourself. Allow plenty of meat per person - at least one sausage, one burger and one piece of steak/chicken or pork, depending on what you are cooking. Buy the very best you can afford. If this means having more salads and breads than meat then that is better than buying lots of low quality meat. You can introduce some really exciting flavours by marinating your meat. Make sure the flavours are complementary, such as honey and mustard or chilli and lemon. Allow plenty of time for the flavours to develop, although be aware than any acidic ingredients (such as lime juice) can start to cook the meat, so use these for a maximum of two hours. A good way to marinate your meat without making a mess is to put all the ingredients in a sealable plastic bag. Gently press out the air and massage the flavours into the meat. This works especially well with slashed chicken pieces as the flavour penetrates through the flesh. Another way to introduce more flavour into your meat is to add wood chips to your barbecue. They are becoming more widely available in large supermarkets, or from American on-line retailers. 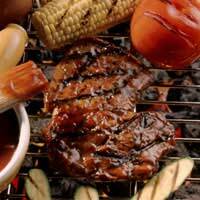 You have a choice of flavours such as hickory smoke or apple smoke, which can add an authentic flavour and smell to your barbecue. You do not need to cook meat from raw on your barbecue. Chicken and pork benefit from oven cooking for a while, as they are not safe to be eaten undercooked, like beef. This allows for the chicken or pork to have the barbecue taste, without the likelihood of being undercooked or overcooked. Once you have cooked all the meat you want, you can make the most of the burning embers and cook some desserts. Take a piece of foil, add a banana, some chocolate, almonds and a dash of liqueur and wrap in all up. Place this parcel in the coals for ten minutes of so and serve with some whipped cream. Alternatively, you could try spearing some marshmallows on a skewer and holding it over the hot coals. One way to make a good barbecue great is to match all the elements - if you have bought nice juicy spare ribs, marinate them in a little barbecue sauce and cook them over a hickory smoked wood chip barbecue. You can serve side dishes that match the theme, too, such as corn on the cob and salsa. Perhaps play some country music and add a checked shirt and there is a party just waiting to happen!